Baily, Paul. Long Island Whalers. Amityville, New York: 1959. Bayles, Thomas R. “Log of the Whaler Sheffield.” Moriches Tribune. April – May, 1949. Coté, Charlotte. Spirit of Our Whaling Ancestors: Revitalizing Makaj and Nuu-chah-multh traditions. Seattle: University of Washington Press, 2010. Diddel, Margaret Thompson. Thistle in Her Hand: The Sea Adventures of a Young Whaling Wife. New York: Windswept Press, 1988. Dolin, Eric Jay. Leviathan: The History of Whaling in America. New York, London: W. W Norton & Company, 2007. Fielding, Stephanie. A Modern Mohegan Dictionary. Uncasville: Mohegan Council of Elders, 2006. Foster, Mark, Whale Port. Boston: Houghton Mifflin Company, 2007. Jefferson, Thomas. An Unkechaug Vocabulary (1791) in Strong, John A. The Unkechaug Indians of Eastern Long Island: A History. Norman: Oklahoma Press 2011 Appendix, pp. 281-284. Mandell, Daniel R. Tribe, Race, History. Native Americans in Southern New England, 1780- 1880. Baltimore: John Hopkins University Press, 2008. Meyer, Charles. 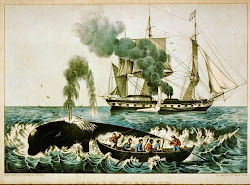 “Whaling and the Art of Scrimshaw,” Long Island Heritage. August 1981, p. 11. Salisbury, Neal. “Embracing Ambiguity: Native People and Christianity in Seventeenth-Century North America.” Ethnohistory 50:2 (Spring 2003). Schmitt, Frederick P. Mark Well the Whale: Long Island Ships to Distant Seas. Cold Spring Harbor: Whaling Museum Society, 1971. Speck, Frank and J Dyneley Prince. “A Glossary of the Mohegan-Pequot Language,” in American Anthropologist N.S. # 6 1904: 18-45. Strong, John. The Montaukett Indians of Eastern Long Island. Syracuse: Syracuse University Press, 2001. Strong, John A. The Unkechaug Indians of Eastern Long Island: A History. Norman: University of Oklahoma Press, 2011. Tooker, Elisabeth, ed. Native North American Spirituality of the Eastern Woodlands: Sacred Myths, Dreams, Visions, Speeches, Healing Formulas, Rituals and Ceremonials. New Jersey: Paulist Press, 1979. Treadwell, Donald (Lone Otter). Turtle People. Unpublished manuscript. May 1988.